“OCHD sent [a] letter to [the] refugee indicating they were identified with latent TB and to come into the Health Division for follow-up,” the spokesperson adds. “Refugee made an appt for Jan 2016. Testing did not [reveal] Active TB until almost the end of March this year,” the spokesperson concludes. In fact, at least one case of active TB among resettled refugees has been identified in every state that has provided this information to Breitbart News when requested. A number of other states, including New York, Pennsylvania, Tennessee, and Massachusetts, have refused to provide this information or say they do not have it. The Refugee Act of 1980, however, requires all refugees to undergo overseas medical examinations prior to their arrival in the United States, and recommends they undergo additional domestic medical screenings within 90 days of their arrival in the United States. The act also requires the results of those examinations, particularly those that reveal the existence of medical conditions that pose a public health threat, to be reported to state and county health authorities in the geographic area in which each refugee is initially resettled. Under federal, state, and local statutes, as well as basic standards of transparency and open government, state and local health departments have an obligation to make the aggregate data from those reports available to the public. The Michigan Department of Health and Human Services has not readily produced refugee health data for the entire state, and has required Breitbart News to file a public records request to obtain this data, which seven other states make publicly available as a routine matter. Breitbart filed that request on September 7. Though the state of Michigan has not yet produced the requested data, by state law it has until Wednesday to do so. Breitbart News has requested to learn the percentage of refugees who arrive in the state that complete initial domestic medical screenings, how many of those are diagnosed with latent TB infection, how many of those successfully complete treatment, the number diagnosed with active TB upon initial domestic medical screening, and the number who are diagnosed with active TB within five years of arrival. The Iraqi refugee in who was diagnosed by OCHD with active TB in March of this year was flagged by the CDC for latent TB infection during the overseas medical screening, which likely took place some time between January 2015 and arrival in the United States in June of that year. The progression of how OCHD handled this case is textbook perfect in terms of following the right protocols subsequent to its notification by the CDC that the refugee had latent TB, a B2 classification. But it also raises questions as to why the case of active TB was not identified by the Arab American Chaldean Council, which was awarded a three year contract in January 2012 by the Michigan Department of Health and Human Services to provide initial domestic medical screenings to the all refugees arriving in Oakland, Macomb and Wayne counties. That contract was renewed for an additional three years in August 2015. It is indeed correct that private physicians provide these screenings. However, the Arab American Chaldean Council has a contract with MDHHS to coordinate the screenings in the Metro Detroit area (Wayne, Oakland and Macomb counties). With one exception, the Arab American Chaldean Council does not actually provide the screenings. The Council refers the refugees to private doctors elsewhere who actually conduct the screenings. That one exception is in Wayne County. In Wayne County, the referral goes to an Arab American Chaldean Council clinic that does conduct the screening. Under its contractual obligations with the Michigan Department of Health and Human Services, ACC is required to test every arriving refugee in Oakland County who consents to an initial domestic medical screening for latent TB infection. The Refugee Act of 1980 requires ACC to transmit that information to the Oakland County Health and Human Services Department (OCHD), and to monitor the treatment of that patient for latent TB subsequently. It is unclear if the Iraqi refugee who was diagnosed by OCHD with active TB in March 2016 ever completed the initial domestic medical screening ACC is contracted to provide to all consenting refugees within 90 days of their arrival in the United States. If such an initial domestic medical screening was conducted, it is not known if ACC confirmed the patient’s diagnosis of latent TB (first identified overseas by the CDC), whether it initiated the required treatment for latent TB, and whether it initiated the proper tests to determine if the patient had developed active TB. Breitbart News asked the Arab American Chaldean Council (ACC) for comment but received no response. In June, Oakland County demanded that the federal Office of Refugee Resettlement (ORR) conduct consultations with it, as required by the Refugee Act of 1980, prior to the resettlement of any refugees. The ORR responded by, in effect, refusing to comply with the law, and placing its positive burden for consultation upon Oakland County. Approximately 450,000 legal permanent immigrants and 75,000 refugees enter the United States annually after receiving required medical examinations by overseas panel physicians (physicians who follow the CDC medical screening guidelines provided to the U.S. Department of State). . . After arrival in the United States, all refugees are recommended to obtain a medical assessment by a health-care provider or a health department within 30 days. In addition, immigrants with certain medical conditions such as noninfectious tuberculosis at the time of the original medical examination are recommended to be evaluated after arrival to ensure that appropriate prevention or treatment measures are instituted. . . Notifications for all newly arriving refugees (with or without medical conditions) and immigrants with medical conditions are provided by CDC’s Electronic Disease Notification (EDN) system. “All 50 states and DC received notifications of arrivals with tuberculosis classifications, which are in three categories of health risk.” according to the CDC: Class B1 (tuberculosis without a positive sputum smear or culture for tuberculosis), Class B2 (latent tuberculosis infection), and Class B3 (contact with a person with a case of tuberculosis). Of note, Michigan had one of the lowest TB treatment follow up rates of any state in the country in that study, only 36 percent. State and local health departments are asked to complete tuberculosis follow-up evaluations of persons with tuberculosis classification in the EDN system. 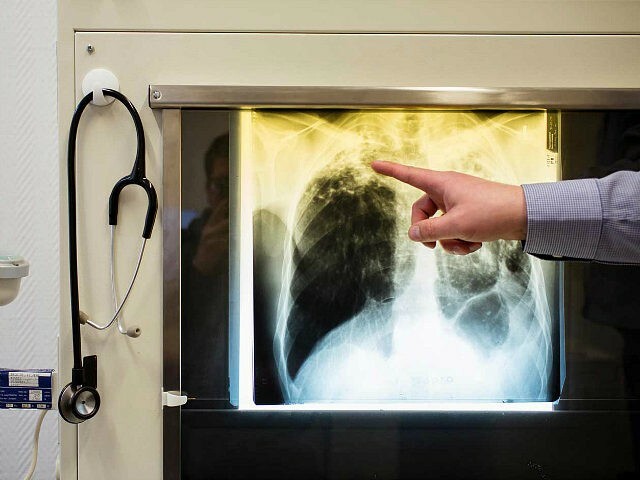 The tuberculosis follow-up evaluation form was expanded from the CDC form 75.17 (2) to include additional testing conducted during the U.S. medical evaluation, such as a skin test, radiology, microscopy, and bacteriology, as well as treatment. State health departments can access the health information from overseas medical examinations in an electronic analyzable format and as a scanned copy of the paperwork for all refugee arrivals and immigrants with tuberculosis through the secure EDN website. Breitbart News has requested this and other refugee health data from the Michigan Department of Health and Human Services for the years 2011 to 2015, but has not yet received it. Several medical studies, including one conducted at the University of California at San Diego in 2013, have concluded that high rates of latent TB infection among resettled refugees pose a risk of active TB within the communities where the resettled refugees reside. Among the general population in the United States, 4 percent of the population has latent TB infection. Ten percent of the general population with latent TB infection develops active TB within their lifetime. Although the cause of latent TB infection activation is not entirely clear, most studies indicate that activation is closely related to declines in the immune system of someone with latent TB. That appears to be the reason why resettled refugees have a higher rate of activation than the general population. Resettled refugees also come into the country with a much higher rate of latent TB infection than the general population, ranging from 15 percent in Texas to 35 percent in Vermont. Latent TB tests are usually given overseas only to children, but in some cases adults get them too. Several CDC scientists have recommended that all refugees be tested for latent TB overseas and treated for the condition prior to arrival in the United States, but that recommendation has not yet been implemented. Oakland County, with a population of 1.2 million, has about 12 percent of Michigan’s 9.9 million population. As Breitbart News reported, the number of refugees arriving in Michigan so far in FY 2016 (which ends September 30) is up 43 percent from the same period in FY 2015. In FY 2015, over 486 refugees from Iraq alone were resettled in Oakland County, or about 16 percent of the 3,013 refugees from all countries of origin resettled in the entire state. Breitbart News awaits the response from the Michigan Department of Health and Human Services to learn the total number of refugees in Michigan diagnosed with active TB over the past five years, as well as the percentage of arriving refugees who test positive for latent TB.